Whilst GoAnimate's studio is one of the best, free online animation tools around it's not the only free tool out there. Hence I thought I'd start an occasional series looking at what other animation tools are availble, the first being Smash Mash.TV. 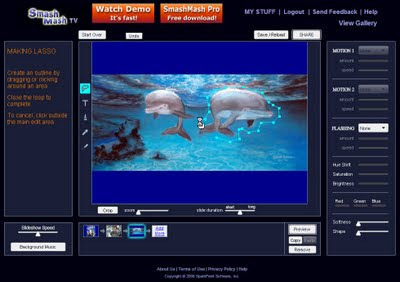 Smash Mash.tv is a combination of a free online animation and slide show application teamed with a downloadable 'Pro' version with more features that you can trial for 30 days then opt to purchase. What makes Smash Mash interesting is that it specializes in one particular style of animation - the mash up. It allows you to take any bitmap image(i.e. photos etc.) and simply, by defining areas you want to apply movement to, make an image come alive. Each area can have up to two preset movement effects applied to it as well as one flash (or colour) effect. All the effects can be adjusted using sliders to vary how much of the effect you want to apply. You can also add text and speech balloons to your images as well as draw directly onto each frame with the paint brush tool. There is also the ability to add sound to your shows. I was very impressed with how easy Smash Mash is to use. I simply watched the short demonstration video and then dived right in learning the tools and sliders as I went. In less than an hour I had a three slide animation with music and speech balloons finished and ready to share (which the site makes very easy to do with links to a range of popular sites). You can see my simple animation below. Anyone who has ever used the lasso tool in any graphics software will find Smash Mashes editor a breeze. That's really as technical as this application gets. However as simple as it is I'm sure with further exploration an advanced animator could really produce some impressive shows. Probably the only disappointment I have with the online version of Smash Mash is that, just like GoAnimate, there's no way to download your animations or export them into a single video file. However if you're prepared to buy the downloadable pro version (which is not that expensive) then this issue is solved. The pro version not only allows you to create your animations offline but also gives you the option to upload it to your Smash Mash account or save it to a video file (that you can upload anywhere). I haven't covered all the features of Smash Mash such as the ability to import audio from Youtube videos amongst other things. If this type of animation sounds like your sort of thing then I'll leave it up to you to really explore what Smash Mash has to offer. How do i get to smashmash website? This post is from 2009 and the link to the smashmash website is no longer active. It's likely they went out of business or perhaps renamed their software and moved on. Either way I don't know how to get to their site - if they still have one.